It’s all settled: I am mad. Last week I discovered something new. And as with most of my discoveries, I’m about a decade behind in discovering it. Yes, my faithfuls, that game you all left behind your junior year of college–the Settlers of Catan —has only recently found it’s way into my home and my psyche. And I’m not very good at it. And that makes me mad. It makes me mad that I’m always just one settlement, one city, one Development Card away from winning. It makes me even madder when my seven-year old son steals my Longest Road card for the win. And I rage–oh how I rage–when my smug, victorious husband walks away–yet again–with the triumph that should have been mine. He’s already stolen my youth and beauty; must he steal my Settlers of Catan victory, too? I find myself yelling–for real yelling–at my husband while he negotiates a trade with our little boy that could jeopardize my next move. I accuse said husband of taking advantage of said son’s young age. He accuses me of using my accusation against him to manipulate my son into rejecting said trade, all to advance my own interest. My son looks at us both with confusion and contempt. It isn’t pretty. And that’s the mild stuff. The real sound and fury came a few nights ago when Derrick jilted me out of a mightily deserved win due to an alleged “technical error.” I felt the “error” (whatev) should have been overlooked, since I was playing for only the second time and my oversight was a common one among new players. Derrick resolved that should the mistake be excused, my victory would be tainted and thus go unrecognized by him. The choice was mine: I could stand my ground and walk away with a win–but no bragging rights–or I could concede his point and continue playing with the possibility of an eventual, “legitimate” win (which my first win was, cheater.) Either way, my hard-fought, eagerly anticipated victory was spoiled. And boy was I mad. my hard-fought, eagerly anticipated victory was spoiled. And boy I was mad. He said: “Come on, Jen. Don’t be mad. I’m offering to split it with you.” Oh be still my heart. Such a sacrifice. He said: “We have to play by the rules. Otherwise winning doesn’t mean anything.” Oh, so noble. Such a purist. And I marched up the stairs, slamming my slipper-covered feet into the carpet as loudly as I could. (It wasn’t very loud.) I shut the bedroom door soundly, as slamming it may have lessened my credibility at this point. I changed huffily into my Mom Power Suit (snowflake flannel pajamas), washed my face, brushed my teeth, and got into bed. And I lied in bed for a long, long time, unable to fall asleep. Because I was mad. And I heard Derrick get into bed two hours later and I still couldn’t fall asleep. Because I was mad. And I heard him snoring softly, no doubt dreaming blissfully about his smarmy win. And I had to listen to it as I lied next to him, wide awake. Because I was mad. The kids looked at each other and then back at me with large, silent eyes as my husband walked quietly backward out of the room. No takers. I’ll start with the bling. You’ve heard the rumors. Here’s what really went down that night. Previous Article Sisters by chance, enemies by choice. Next Article Ten reasons I love Leonardo DiCaprio. 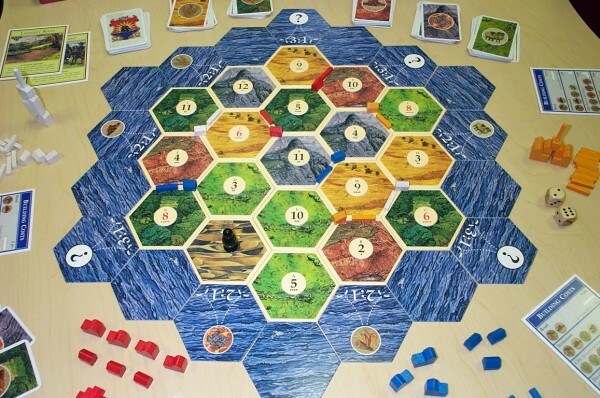 Okay, if so many of our friends play Settlers, when are we having a Settlers night? We are ALMOST to the point that Scott won’t play it with me anymore…I really do try not to get upset!! I know it is just a game…:) So who is in??!! 🙂 Let’s do it! @Aaron–What? I only remember playing “Ticket to Ride.” I have no recollection of ever playing “Settlers of Catan” with you guys. Am I losing my memory? Because that would make me mad. Haha! We’ve had for real fights over that game. In fact there was a couple in a previous ward that we had to stop hanging out with over that game (the husband was a jerk…always) Good times! Yet I still love it. Game night anyone?? We love that game still! It’s so fun. We have a good house rule we add in though. The robber can be placed on the desert every other time it’s rolled and the person who moves it there (with the 7 roll) can take any one card from the bank. This limits the stealing and helps you get the card you really want, but also doesn’t take from the other players. You can decided which to do on your turn.